Initially founded primarily as a real estate agency, J&C Services soon added their signature “J&C Welcome Service” designed to help new arrivals settle in, and later included insurance brokerage to their suite of services. With its diversified affiliations, J&C Services in able to provide a complete range of insurance coverage to both individuals and corporations from office, home and content coverage to motor, health and personal accident insurance. J&C Services’ Finance & Office Manager, Mrs “Nounou” Arinya Phonseya said she is convinced that the company’s strongest asset is its team who understands the needs of the foreign community & business organizations. 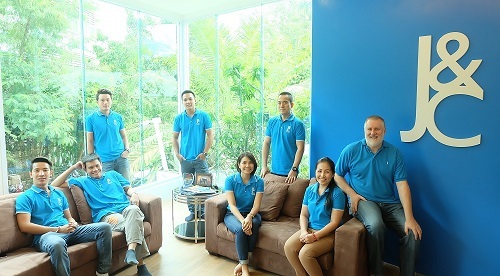 As a client-focused business, Phoneseya said the team is committed to delivering service throughout the length of the client’s stay in Laos and that their services don’t just stop when the ink on the contract dries. “We take great pride in our services, including our online information feeds,” further explained Phonseya. Over the years, J&C Services has also established itself as the trusted source of online information and news of interest to those in the expatriate community which it disseminates on both its website and Facebook page. Today, the company’s Facebook page has more than 22,000 followers. J&C Services is a member of the European Chamber of Commerce in Laos and maintains business relations with several organizations in Laos including Phu Bia Mining, Minerals and Metals Group (MMG), Crowne Plaza Hotel, Vientiane International School, Silver Heritage, Burapha, Bank Franco-Lao (BFL), Swiss Agency for Development and Cooperation (SDC), the Mekong River Commission, Medecins du Monde, to name a few.